Last weekend's Download Festival included countless awesome performances (we're still recovering from the after effects of Abe Cunningham's almighty snare sound), but for us, one of the coolest came when the Brighton Institute of Modern Music (BIMM) linked up with US enormo rockers 30 Seconds To Mars. The band invited six drummers (among a load of other guests by the looks of the video below) from BIMM to join them onstage as they belted out crowd-pleasers 'Kings and Queens' and 'This is War'. The sextuplet - all of whom are second or third year BIMM students - joined the band during their Ronnie James Dio Stage headlining set at the Donington rock feast. 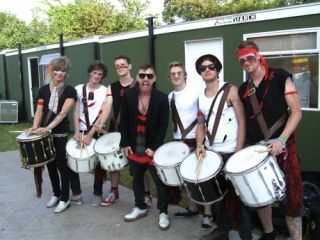 Jamie Boyce, one of the lucky players, beamed: "We got a call just the Thursday before that 30 Seconds To Mars needed six drummers for their headline show at Download Festival - in just two days time. It was particularly exciting for me as I am a massive fan of the band. "Getting on stage was an absolutely incredible experience. Suddenly we were in front of thousands and thousands of people - it really took your breath away." Pretty cool, huh? For more information on BIMM visit www.bimm.co.uk.